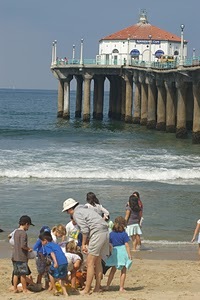 Love the Roundhouse Aquarium at the end of the Manhattan Beach Pier? Now’s your chance to show it! Coming up on Tuesday, January 29 is a fundraiser for the Roundhouse, to be held at one of its closest neighbors, The Strand House. An $80 ticket gets you two drinks, Strand House appetizers, and the knowledge that you’re helping a worthy cause. All proceeds will go toward much-needed repairs at the Roundhouse. Need more convincing? The Roundhouse is an amazing community resource, teaching young and old alike about marine life and conservation. It’s open to the public free of charge, seven days a week. But it takes support from the community – lots of it – to keep the Roundhouse “afloat.” Even if you can’t attend the fundraiser, consider making a donation to the cause. Roundhouse Aquarium Fundraiser, January 29, 6:00 pm to 8:00 pm. Location: The Strand House, 117 Manhattan Beach Blvd., Manhattan Beach. Contact: Friends of the Roundhouse, 310-344-7251. Think you’ve seen it all at the beach? Think again. The Roundhouse Marine Studies Lab and Aquarium (you can just call it “The Roundhouse“) at the end of the Manhattan Beach pier will have you seeing the beach as you’ve never seen it before, with live aquatic creatures and informational displays that plumb the depths of ocean life. Want to touch an echinoderm? These spiny skinned sea animals – a family that includes sea urchins, sea stars, and sand dollars – are in the “please touch” tank for your kids to check out. Want to know how long it takes a disposable diaper to disintegrate in a landfill? Hint: It’ll take longer than any of our lifetimes. Ever heard of the sarcastic fringehead? It’s a crazy-looking fish that you can check out in the upstairs tanks. If you have little kids who love fish, stop by on Sunday mornings at 11:30 for a special marine-themed storytime. The Roundhouse also hosts “Sleep With the Sharks” sleepovers for older kids; you can also host a birthday party or a special event there. For an educational experience in a cool setting, it’s hard to beat the Roundhouse. That’s why South Bay Sparkle calls it one of the true jewels of the South Bay. The Roundhouse is open to the public, free of charge, with a suggested donation of $2 per inidividual or $5 per family. Open M-F 3pm to sunset; Sat.-Sun. 10 am-sunset.